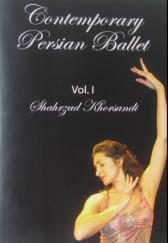 Intended for the intermediate/advanced dancer, this DVD introduces a unique style, combining rhythmic foot patterns with fluid movement transitions, while emphasizing movement of arms, hands and wrists, and coordination of arms and legs, while harmonizing foot patterns with Persian music. The smooth and circular transitions, and line and positioning of the body reflect aesthetics of ancient Persia, while the choreography and technique are contemporary. This video is an introduction to the Persian style of dancing, with emphasis on posture, position and movement of the arms and hands, and rhythmic foot patterns. This condensed program consists of 10 different steps, broken down to be easily practiced in sections. Those steps are then put into a choreographed sequence, with counts. The program ends with a staged performance of the choreography by three Shahrzad Dance Academy dancers in full costume. Intended for the intermediate dancer, this video introduces new, more complex movements in the Persian style. Beginning with a warm-up, this program includes a set of arm/hand/foot exercises specific to the Persian style of dance. It ends in a staged performance with two dancers performing a longer variation of the routine demonstrated in the program. Also, check out our Bellydance, Dance Fitness videos, Exotic Dance, Hula, Multicultural or view all our Dance Videos and DVDs. Recommend this Instructional Persian Dance DVDs and Videos page to a friend - choose email in orange share box.